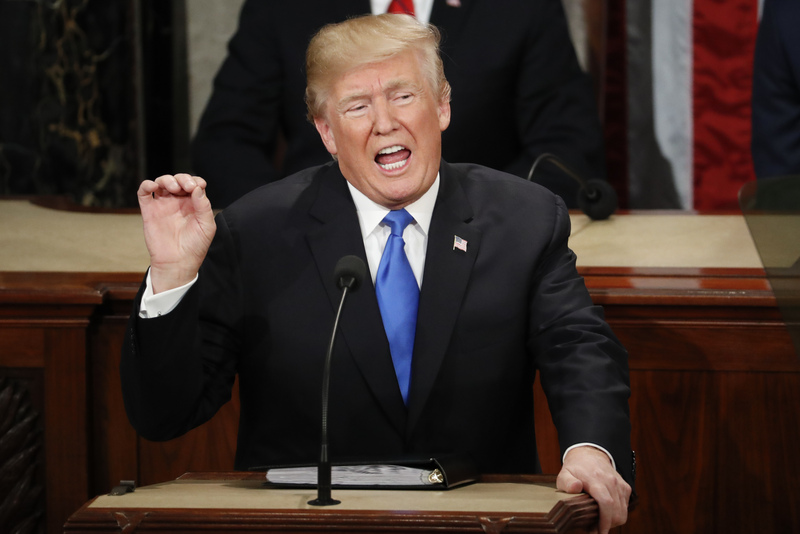 President Trump introduced his proposal for immigration reform with references to gang violence, terrorism and drug trafficking during the State of the Union address. The “four pillars” of his immigration plan are necessary to “protect Americans,” according to the president. Those pillars include: increasing border security, ending extended-family chain migration, eliminating the visa lottery and legalizing 1.8 million undocumented immigrants, including Dreamers—undocumented immigrants brought to the United States as minors. President Trump introduced his proposal for immigration reform with references to gang violence, terrorism and drug trafficking. In his State of the Union address, the president said “a single immigrant can bring in a virtually unlimited number of distant relatives” through family-based immigration. Due to backlogs in the immigration system, along with country quotas that already exist, it can take more than 20 years for a family-based petition to go through. There are currently four million people waiting on a family-based immigration petition. The president seemed to insinuate that immigrants, once they become citizens, would be able to petition for their cousins, aunts and uncles. Yet petitions are actually filed for spouses, children, parents and siblings. Theoretically, a child could petition for a parent, who could in turn petition for a sibling. But that process would take 20 to 40 years. While Mr. Trump claimed merit-based immigration would help U.S. citizens, Mr. Appleby noted that family-based immigration actually helps the economy. Ashley Feasley, director of migration policy and public affairs at the U.S. Conference of Catholic Bishops, described the change in terminology as “an attack on legal family-based immigration by the Congress and the White House.” She sees it as an attempt to undermine the contributions of immigrants to the United States. “It’s really important that we remember we’re talking about people who, in many cases, have spent years waiting due to our broken immigration system,” Ms. Feasley said. While the church supports a sovereign nation’s right to defend its borders, Ms. Feasley said, “we need to be careful about allocating funds in a way that’s humane and proportionate.” Closing legal paths of entry for asylum seekers and unaccompanied minors, something the president referred to as “closing loopholes,” is not humane. Bishop Vásquez urged Congress to pass a bipartisan solution soon. The ubiquitous "bishops condemn" argument and angry Trump photo. Do the bishops believe the US should obey its immigration laws? Will the bishops take a position on allowing illegal immigrants to stay while those who are applying based on the laws of the country often have to wait years? Will the bishops compare the US immigration laws to those of other countries? Will the bishops criticize African Americans who want a cut back in immigration? Will the bishops visit the towns of the states who economy has been wrecked by the immigration of low skilled immigrants? Maybe the bishops should have an open debate. Nearly all immigrants came to the United States without bringing extended families. I believe the proposal is for immediate family which is husband and wife and children. If extended families are so important, then that is an argument for sending the illegal immigrant back to their home country where they can enjoy the values of this type of family. Aside - Will we see other criticisms of the President's speech by the editors and authors? It will be tough because this particular speech was well received. But with Trump, that is a fleeting phenomenon. The description of "chain migration" as presented in this article is grossly misleading. For starters Sister Markham's claim that the phrase "Chain Migration " is some kind of pejorative is nonsense. It is a phrase started and used by demographers since the mid 1960s,and has been used by both Democrats and Republicans ever since without any hint of negativism. Respecting Chain Migration, author states it's not really an issue because "....that process .. take[s] 20 to 40 years". However he ignores the fact that Department of Homeland Security reports that over a period of the past 35+ years the aggregation of all such procedures has accounted for @60% of the total all immigration ! So the author might be correct if this were Day 1 for Chain Migration but we are some 50 years into this process and the cumulative effect cannot be so easily dismissed. Further the Dept Of Homeland Security reports that about 21% of those immigrants resulting from Chain Migration since 1980 were over 50 years of age. While this sounds compassionate , the economic and social implications of that percentage cannot be just dismissed. They are not just pluses to the economy as the quote from Mr Appleby states. That an immigrant cannot bring his/her parents or grandparents to the US does appear to be a tactic to curb immigration from non European countries. As people from poor countries may not want to leave aging parents or grandparents behind forever while they are living the first world good life of 21st century medical care, standard of living, relative political stability. We're back to the square one charge; Trump is about "make America white again". Parents and Grandparents should be allowed to join their adult children. Parents are not excluded by the proposed legislation. I consider myself a proponent of immigration and a never-Trump voter. However, I have to admit I like Trump's immigration proposal. First, it goes further than Obama in taking care of the DACA problem. Second, it strengthens the borders and reduces the incentives for the illegal immigration that created the DACA problem in the first place. Third, it ends the discriminatory diversity visa lottery, where nations with a lot of immigrants already here are excluded. Why should there be a barrier to British and Canadians, just because we already have a lot of immigrants from there already? And the end to chain migration is only for extended family members, not for the nuclear family. But, the best part is the movement to a merit-based system (like Canada and Australia) and to people who will admit to a love for America. It seems right that the US should never open its doors to anyone who doesn't have a particular love for American ideals and people. So, count me on board for this proposal. I do wish the writers of this article were more balanced in their coverage. The greatest bias in the media is in the selection of topics to cover. I note that 2 days ago, the Democrats filibustered a pro-life bill (Pain-Capable Unborn Child Protection Act) that would have banned abortion after 20 weeks (there are only 7 nations in the world that allow such late abortions) and not a word from this "pro-life" Journal. I wonder if you hate Trump more than you love the unborn child? Would pro-life advocates attack families? Probably not, but would someone else? Perhaps. A vibrant family strengthens the middle class. A middle class expressing its will could mean sleepless nights in the aristocracy. What about the border? Family doesn’t threaten anything. Maybe laws should strengthen the family and not the aristocracy. I am glad you are coming around to being a Trump supporter. The aristocracy is cringing at Trump's policies and the middle class are cheering. The Democratic Party became the Party of elites about 40 years ago and depends on a subservient underclass for support. Just look at who the Democrats chose for the SOTU response, a Kennedy. Trump is a win for those who oppose the elites and a win for the little guy. As they used to say in New Zealand when I lived there, "Good on you mate." THE US bishops are the most vocal fear-mongers in the US Catholic Church. They should be encouraging "migrants" to seek the proper immigration channels rather than put the onus onzen-Catholics. The Democrats will NEVER compromise with President Trump. They are obstructionists. Having said that, I understand that during the Obama administration there were Republican obstructionists, too. Time to stop that immature behavior. Finally, like the activist homosexual movement, immigration extremists will not be satisfied with anything less than total surrender to all their demands. This article also appeared in print, under the headline "Church leaders call Trump’s proposal to end ‘chain migration’ a threat to families," in the March 5, 2018 issue.